PHP Array Map Example | array_map() Function Tutorial is today’s topic. The array_map() is the inbuilt function in PHP, and it helps to modify all the elements one or more arrays according to some user specific condition in a straightforward manner. The array_map() function sends each value of an array to a user-defined function and gets an array with new values applied by the user-defined function. It applies the callback to the elements of the given arrays. The syntax of PHP array_map function is following. The myfunction parameter is required, and it is the name of the User Defined Function. An array1 parameter is a required parameter, and it specified an array. The array2, array3 are optional parameters, and it specified the arrays as well. It returns an array containing the values of array1, after applying the user-made function to each one. We have defined one array and then pass that array to the array_map function, and that function returns the square of all the items of the array and forms a new array with that values. The output of the above code is the square of all the items. See the below output. 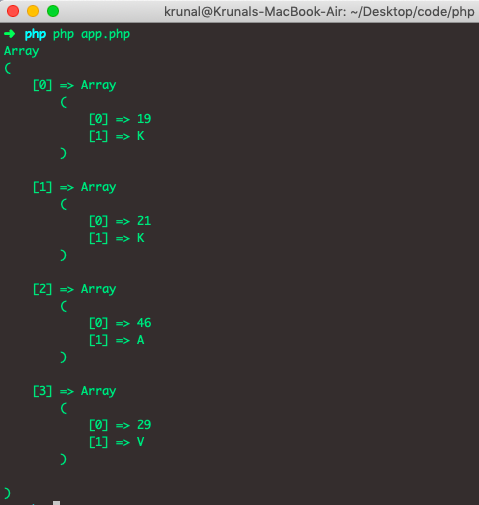 We can also use an array_map() function in PHP to create the array of arrays. If we want to do this, we have to pass null as a parameter in place of the functionName parameter and the list of arrays to create an array of arrays. See the following example. Let’s take three arrays and pass those arrays to an array_map function and see the output. Let’s pass the associative array to the array_map() function and see the output. Lambda function means it has no name. See the following example. We have used the $func as lambda function and range() function to provide the value between 1 to 5. See the below output. Finally, PHP Array Map Example | array_map() Function Tutorial is over.